It has not been play tested. Includes case but may not include original box. This item is sold AS-IS and does not include warranty. The modern compromise tuning is ideal for single note playing in different positions in contemporary blues, rock, jazz, soul, funk, while still ensuring a full chord sound, making the Crossover an optimal addition to the great Marine Band range. Hohner Marine Band Crossover Harmonica. Channel openings and reed plate edges rounded off for greater playing comfort. Hohner harmonicas feature A unique Hohner sound that is a tone benchmark for blues, folk, and rock. Reedplates: brass; 0.9 mm. Reedplates: brass. 9 mm. Easily adjustable for overblows. Precision die punches to ensure reed plates with unparalleled air tightness. Hohner harmonicas feature A unique Hohner sound that is a tone benchmark for blues, folk, and rock. Exceptional sound and a sealed bamboo comb make it the professional player's go-to harp. Easily adjustable for overblows. Hohner harmonicas feature A unique Hohner sound that is a tone benchmark for blues, folk, and rock. Comb: sealed bamboo (patent pending). Precision die punches to ensure reed plates with unparalleled air tightness. Hohner harmonicas feature A unique Hohner sound that is a tone benchmark for blues, folk, and rock. Precision die punches to ensure reed plates with unparalleled air tightness. Easily adjustable for overblows. Hohner harmonicas feature A unique Hohner sound that is a tone benchmark for blues, folk, and rock. Reedplates: brass; 0.9 mm. Reedplates: brass. 9 mm. New Gear: If you’re not satisfied, neither are we. 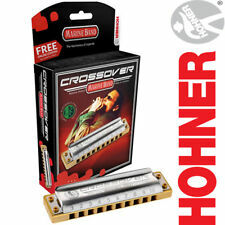 HOHNER Marine Band Crossover Harmonica. The modern compromise tuning is ideal for single note playing in different positions in a wide range of contemporary styles, while still retaining a full chord sound, making the Crossover an optimal addition to the great Marine Band range. Hohner harmonicas feature A unique Hohner sound that is a tone benchmark for blues, folk, and rock. Precision die punches to ensure reed plates with unparalleled air tightness. New Gear: If you’re not satisfied, neither are we. Marine Band Crossover Harmonica M2009. Hohner harmonicas feature A unique Hohner sound that is a tone benchmark for blues, folk, and rock. New Gear: If you’re not satisfied, neither are we. It’s that simple. The Hohner Marine Band Crossover is the perfect harp for players that find themselves playing rock, blues, jazz, soul, funk, or any combination of these styles. The Marine Band Crossover harmonica features compromise tuning, which makes it just as great for playing single notes as it does for getting those fully developed chord sounds. HOHNER Marine Band M2009 CROSSOVER Harmonica with Case. The modern compromise tuning is ideal for single note playing in different positions in contemporary blues, rock, jazz, soul, funk, while still ensuring a full chord sound, making the Crossover an optimal addition to the great Marine Band range. It features Hohner's new classic reed profiles for longer reed life and improved frequency response. The channel openings and the reed plate edges are rounded to improve comfort while playing. It utilizes a laminated bamboo comb that is sealed to repel water and remain stable. Hohner harmonicas feature A unique Hohner sound that is a tone benchmark for blues, folk, and rock. Easily adjustable for overblows. Precision die punches to ensure reed plates with unparalleled air tightness. Hohner harmonicas feature A unique Hohner sound that is a tone benchmark for blues, folk, and rock. Comb: sealed bamboo (patent pending). Reedplates: brass; 0.9 mm. Hohner harmonicas feature A unique Hohner sound that is a tone benchmark for blues, folk, and rock. If you’re not satisfied, neither are we. It’s that simple. Easily adjustable for overblows. item# 1274115055619. Hohner harmonicas feature A unique Hohner sound that is a tone benchmark for blues, folk, and rock. New Gear: If you’re not satisfied, neither are we. It’s that simple. No international accounts.